The Cambridge Companion to African American Theatre. Edited by Harvey Young. Cambridge: Cambridge University Press, 2012; pp. xix + 291, illustrated. $94 cloth, $30.99 paper, $25 e-book. 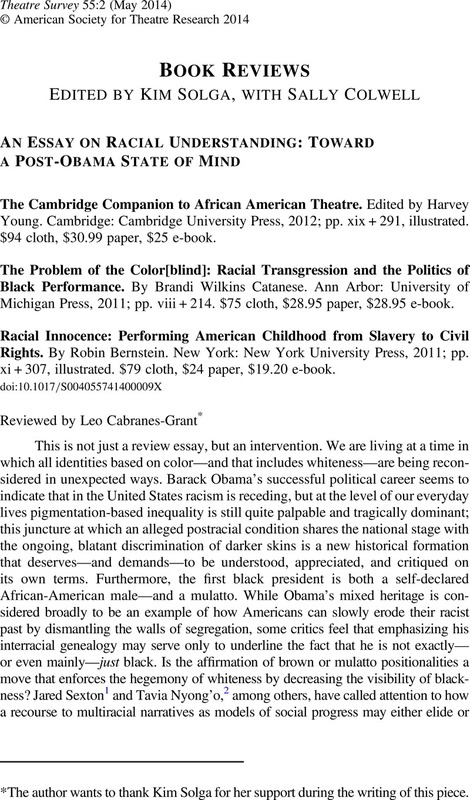 - The Problem of the Color[blind]: Racial Transgression and the Politics of Black Performance. By Brandi Wilkins Catanese. Ann Arbor: University of Michigan Press, 2011; pp. viii + 214. $75 cloth, $28.95 paper, $28.95 e-book. - Racial Innocence: Performing American Childhood from Slavery to Civil Rights. By Robin Bernstein. New York: New York University Press, 2011; pp. xi + 307, illustrated. $79 cloth, $24 paper, $19.20 e-book. 1. See Sexton, Jared, Amalgamation Schemes: Antiblackness and the Critique of Multiracialism (Minneapolis: University of Minnesota Press, 2008). 2. See Nyong'o, Tavia, The Amalgamation Waltz: Race, Performance, and the Ruses of Memory (Minneapolis: University of Minnesota Press, 2009). 3. See Wilderson, Frank B. III, Red, White and Black: Cinema and the Structure of U.S. Antagonisms (Durham, NC: Duke University Press, 2010). 4. See Wilson, August, “The Ground on Which I Stand,” keynote address to the Theatre Communications Group, 26 June 1996, American Theatre 13.7 (1996): 14–16, 71–4. 5. See Brustein, Robert, “Subsidized Separatism,” American Theatre 13.8 (1996): 26–7, 100–1. For Wilson's reaction to Brustein, see Wilson, August, “August Wilson Responds,” in American Theatre 13.8 (1996): 101–7. * The author wants to thank Kim Solga for her support during the writing of this piece.